Even harder than the screenshot boss, or the attendance boss, is the recruitment boss. With the help of a couple of friends of the guild (thanks Aximish and Canaleth) and even cross realm Mythic (thanks Snowbird (even though despite my super clear labeling you thought it was a Heroic run (but still stuck around more than one attempt))), we ventured in to Mythic for the first time in the expansion. Our gear level had some pretty dramatic differences. All the way from 729 iLvl with a maxed out legendary ring and fully upgraded… to 709 and virtually nothing upgraded. We have 7 raiders that are maxed out, rings and all, and the average item level was 722.7. There’s a huge discrepancy when it comes to luck with gems. A couple of people are sporting 6 gem sockets, with several people missing out altogether. The average number of gems is 2.55. We were only missing one legendary ring which was a nice surprise and there were even a couple of missing enchants. Oops. We only have half the raid fully upgraded, with a couple of outliers at zero upgrades. It can be difficult when 100% of your gear has come from just the last two weeks of raiding, but most people are steadily working their way through upgrading as they can find the time. So… fun with spreadsheets over… onto the boss. 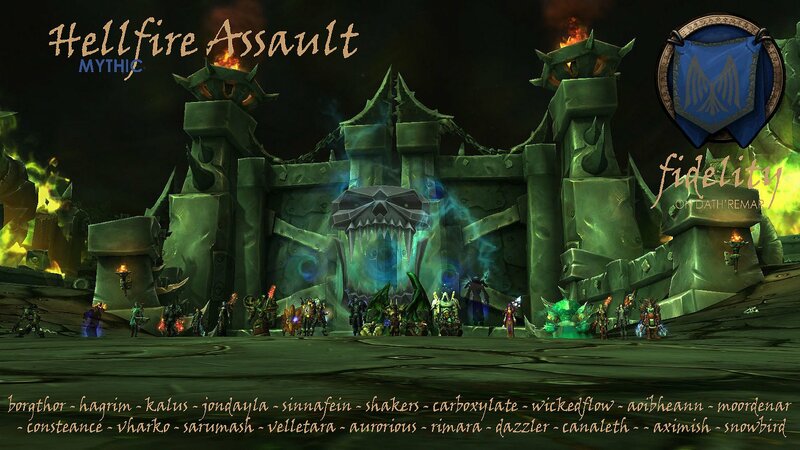 11 attempts and several questionable recruits from Premade Groups was all it took to conquer the assault. The notable changes to the encounter on mythic is that there is a new siege vehicle, two new mini bosses, and the requirement to split the raid in half to deal with the spread of the adds and having two artillery vehicles at the same time. The main challenge of the fight was just to keep up with incoming waves. Once you get a little behind, it snowballs very quickly. Finishing off the felcasters at the right times also made a huge difference to the damage going out into the raid. We ran 4 healers, and while the mythic raid size of 20 has crippled a lot of small guilds, it tuns out to be super convenient for splitting the raid. We burned Mar’tak at the beginning of the fight, but saved Heroism for the first Transporter. We killed Grand Corruptor U’rogg before Grute. It was pretty important that we didn’t push over any Felcasters during the mini bosses, or the damage got excessive. Aside from just getting used to the fight and our DPS increasing, some much improved target switching made a big difference to how easy the fight felt. After the mini bosses were down there was a slight reprieve, but as the fight was drawing to a close we got a little behind with the waves, but were able to kill enough siege vehicles to get us through to our first Mythic kill. Gotta say, the fight really smoothed out as people got used to the switching and kill priorities.